Can you remember who made the last Chablis, Sancerre, Côtes du Rhône or Chianti you drank outside your home? As a reader of this post – and thus someone with at least a passing interest in wine – maybe you can, but I’ll bet most ordinary consumers would have a hard time naming any producers of these wines. If one were to ask the same question about Rioja, they might recall Campo Viejo, Faustino and possibly Murrieta or Riscal, but that would be all. And how many Pinot Grigio or Prosecco brands does anyone know? If, after a fairly lengthy acquaintanceship with Europe’s appellations, we sophisticated westerners have little or no loyalty or relationship with the people who make the regionally-designated wines we drink, what of the Chinese? I’m just back from a trip to see current and prospective consultancy clients in China and was struck by the pride they took in their brand books. 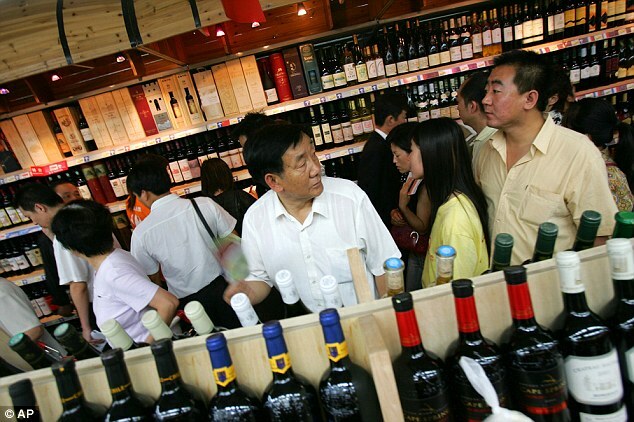 Retail chains with hundreds of stores have registered long lists of Chinese names for western wines. “Look here” one Chinese company owner said, “we have Michelangelo, Napoleon, Prado…” (Actually, these weren’t the brands he’d registered – I’m not at liberty to reveal those – but you get the idea.) As the owner of the Michelangelo brand, he can go out to buy Chianti, Barolo or Montepulciano d’Abruzzo on the bulk market and sell it under that name. Prado will do for Rioja or any other Spanish wine style, while Napoleon can cover France. This isn’t a Chinese phenomenon, of course. In the US, big retailers like Trader Joe’s and Total Wines & More are well known for their “private label” wines; indeed the former chain’s Charles Shaw, aka “Two Buck Chuck” is one of the most famous wine brands in the US, if not the world. Aldi and Lidl, the two fastest-growing major retailers on planet earth boast shelves packed with attractively packaged ‘brands’ you’ll never find outside their stores. And then of course there are Tesco efforts like Ogio and Dino, two of the only Pinot Grigios any British wine drinker is likely to know. All of these have one thing in common: they don’t look like retailer-brands such as Tesco’s Finest (currently Britain’s biggest brand in its own right), they look like ‘real’ brands. So why does global retailers’ embracing of their own brands matter? Well, for many people, of course, it won’t. Lots of consumers will happily get lots more reliable wine that they’ll be perfectly happy with, and lots of big commercial wineries will be increasingly able to find homes for the contents of their tanks. For the romantic chatterati who like to imagine a utopian future where small is beautiful and everyone does all their shopping at farmer’s markets, and for smaller producers looking for routes to market it’s a disaster, of course. Every inch of shelf space that’s occupied by MadeUpName Chianti or Rioja is an inch that’s unavailable to a bottle from a real, identifiable winery. But the trend is also bad news for the bigger brands, whose only chance of getting into the major stores is on the back of ever-increasing marketing “contributions”. (A usage previously more usually associated with Mafia thugs requesting payment for ‘protection’ against their colleagues). And it’s bad news for the appellations. After all, once the retailer has persuaded its customers to trust Michelangelo or Ogio, it is not difficult to change the regional origin of the contents of the bottles. This, after all is a path that is already well worn by ‘proper’ brands like the proudly ‘Californian’ Mark West whose Pinot Noir has unashamedly – and almost indistinguishably – been sourced from both the west coast state – and Languedoc Roussillon. What fascinates me is the way that, over half a century after British, Dutch and Belgian claret drinkers became used to getting chateau-bottled rather than locally-bottled Bordeaux, bulk wine sales and shipment are doing better than ever. Over half of all New World wine is now shipped in bulk and there is a busy trade in bulk sales of such popular and premium-priced French wines as Chateauneuf du Pape. While most wine professionals compare the merits of Prowein, Vinexpo and the London Wine Fair, the trade show that’s quietly gaining the most traction is arguably Amsterdam’s annual Bulk Wine Fair in November. The essential trouble with the bulk market is of course its absolute lack of long-term fidelity. The bottle of Ogio Pinot Grigio or Aldi Chablis you buy today might contain wine that was produced by quite different people from the one you picked up a few months ago. All that’s required is for the liquid to fit the criteria set by the retailer, be available in the right volumes and at the right prices. The lesson for wine producers everywhere is simple: you’re no longer competing with the winery down the road; you’re up against any business that can fill a retailer’s bottles. If you don’t make your brand a lot stronger than the region or category, you may be riding for a very big fall. Hasn't Britain done exactly that wine Chinese teas for centuries? Excellent points, looking into future volume vs. value market trends in Europe is another proof of what you are saying in your post. Ordinary consumers (who don't care about being educated about wine) will love to have less brands to choose from, and already trust their retailers' brands. Therefore, any marketing from producers' brands will pass by almost unnoticed. Wineries are absolutely not prepared for this change, at least not in Europe where marketing and communication efforts are null anyway. Thanks Reka, as usual. you hit the nail on the head – and I fear that few in Europe will understand what's heading their way. Hasn't Britain done exactly that with Chinese teas for centuries? Winemakers belatedly stole the idea, and ran with it, and I don't blame them. You make a very interesting point, Brian, especially with regard to Australia. This reasoning seems slightly confused. First you argue that the strong brands of the future will be the likes of “Michelangelo, Napoleon, Prado”, or Aldi, Ogio (or Tesco, Walmart or Amazon). Then you argue that winemakers need to “make your brand a lot stronger”. This seems to be a bit incoherent doesn't it? Wine producers will never be able to compete with those white label brands. So you're really comparing apples and pears. You're talking about and trying to compare two entirely different market segment. In reverse order, Per, you're 100% right about my blog design. It is overdue for an overhaul. However I stand by the point I was making. I'm not saying that Michelangelo et al will be the strong brands of the future; they'll be the strong brands +for the retailers to whom they'll belong+. Retailers that will almost inevitably have 80-90% of the retail market. These chains will have little space for smaller volume , lightly marketed branded wines, but they may make some for brands consumers know and look for. (As you see in French supermarkets for example). Hence the need for strong branding. Outside those chains, one is in the hands of small independents which generally prefer not to sell the same wines as each other, so the volume sold by any individual winery will be limited. Again, these retailers will make exceptions for strong brands (eg Bordeaux chateaux, Champagnes and port). But finally, the surviving smaller producers – and I think there will be far, far fewer than there are today – will need to do much more direct selling. Which also depends on branding. Yes, it's hard to compare multiple chains with smaller outlets – though they do overlap – but I stand by my point about branding. The only wineries that, in my view, can ignore this issue are small-production producers in desirable regions such as Burgundy and/or with strong, loyal local markets. These are a small minority of the hundreds of thousands of wineries that currently struggle to make a return on their investment. Hasn't Britain done exactly that with Chinese tea for centuries? Historically less so in Australia, though increasing here as everywhere, and not only in wine. Buyers Own Brands released by wine merchants, shippers and negotiants preceded individual winery labels in Britain and France, and once dominated the market. Own labels are still huge. (Ogio, for example) and Tesco Finest is the biggest brand of all. One very big reason you don't mention for the presence of big brands is the impact their marketing “contribution: has on the retailer's bottom line. The shift to a single brand covering several countries is one we've seen ebb and flow (Lindemans, Mateus, Blue Nun, Cupcake have all done it and it's common in the US). Wine people are precious about it, but we accept it in other sectors. Peugeot and Nissan cars are manufactured in the UK, not France or Japan; my Bosch dishwasher wasn't made in Germany and the Guinness you drink in Africa is not brewed in Ireland. All of which makes me think “so what” – provided the consumer is not being hoodwinked (as he admittedly is the case sometimes in the US where they may reasonably think they are getting a Californian wine). But I firmly disagree with your comment that “People spending money on wines are normally either people that know what they are buying or buying based on a review or award”. Reviews and awards represent a tiny fraction of supermarket purchases and, far from knowing what they are doing, most shoppers grab the nearest bottle that satisfies their requirements for colour, style and price. Blossom Hill at £4 is ludicrously cheap; if the brand has any real value (and I believe it does) some might say that it really should not be on sale at that price. Very good post. I'd like to know what countries plus Spain and Argentina are known worldwide for the export of Bulk wine.